Wondering how to play lead guitar? We’ve got your back. 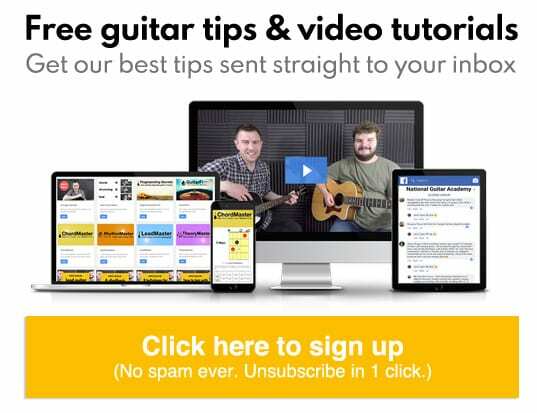 This is the latest in our ‘Ultimate Guide’ series of guitar lessons; these articles are crafted with great care and designed to teach beginner guitarists at lightning speed. Let’s dive in! What do people mean when they refer to ‘lead guitar’? What is the role of a lead guitarist? An overview of the 3 most common guitar ‘roles’: bass, rhythm & lead. What does a lead guitarist actually do? A great example of well-rounded lead guitar style (video). Understanding the all-conquering importance of a song’s key. 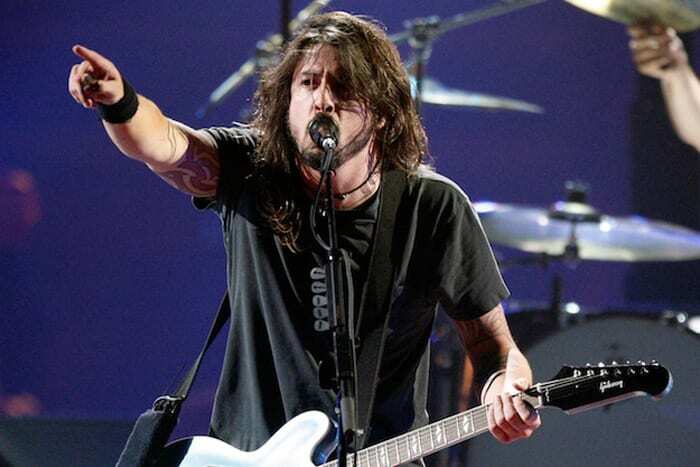 Why lead guitarists MUST know the key of a song (& why it makes things easy). How to identify the key of a song. How to find a scale that will work with the song’s key. 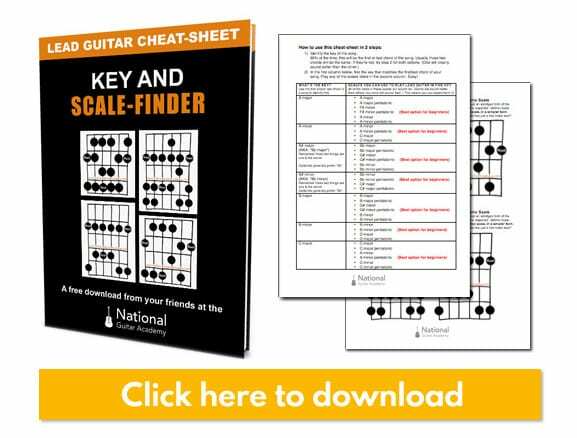 How To Play Lead Guitar: Part 3 – Guitar scales decoded: A simple explanation, at last! NOTE: This guide is easy to read but there’s a lot here (decades of wisdom and experience!) so you may want to bookmark this page for future reference. This will be a guide you can refer back to again and again. Ok, if you want to learn how to play lead guitar then we need to cover a few basics first. What Do People Mean When They Say “Lead Guitar”? The phrase “lead guitar” refers to a style of guitar playing usually performed by the lead guitarist in a band. In a group setting, guitarists have different responsibilities. They each have a role to play to contribute to the whole and it’s important these roles are defined. This is true for groups of all sizes; whether it’s a 16-piece band with a brass section or just two guitarists jamming together. If you want to learn how to play lead guitar, you need to understand the role of lead guitarist. So before we get into specific techniques of how to play lead guitar (riffs, solos, CAGED, etc) let’s define this role a little more clearly, to make sure we’re both on the same page. Holding it down with heavy low-end beats. Big fat notes. Very few chords. Only 4 strings. Compared to lead guitar, this role tends to be based more around chords and strumming. Unlike rhythm guitar, this role is usually more focussed on single note lines and melodies (riffs, licks, solos etc). But chords remain important. A well rounded lead guitarist has good knowledge of the fretboard and CAGED system so they can play alternate chord voicings to the rhythm guitarist. If you want to learn how to play lead guitar well, you need great chord knowledge. So What Does A Lead Guitarist DO? The most visible work of a lead guitarist is ripping into a solo in the middle of the song, but there’s much more to the role than just solos. If you want to learn how to play lead guitar you need to learn how to contribute throughout an entire song. Not just in the solo! 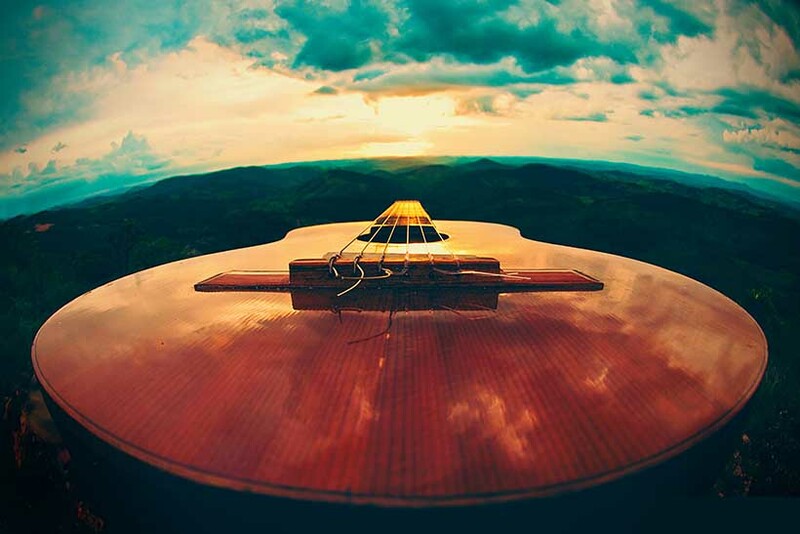 A lead guitarist can drop in and out with complementary moments and melody lines which add to a song enormously. A great way to learn how to play lead guitar is to watch expert lead guitarists. This provides inspiration and ideas. Actively watch (don’t just enjoy the performance washing over you), study it! You’ll spot things you like and then you can learn them. This is Jimmy Page and Led Zeppelin in 1973. Page does plenty of ‘flashy’ and eye-catching things, but there’s great variety and subtlety here too. Learning how to play lead guitar can seem daunting, but it’s great fun and -like any challenge- you just need to break it down into smaller and more manageable steps. There are millions of theories on this, and thousands of books on the subject, but essentially, a lead guitarist simply plays stuff that sounds good with the other stuff that’s being played. So how do we know what stuff will sound good with the other stuff? Well, you need two pieces of information. You need to know the key of the song. You need to know the chords of the song. Once you have these two pieces of information you’re in business. Ideally, you will do both of these things! With these two pieces of information you will KNOW what notes you can play that will sound good. Good lead guitarists are never guessing; they know if a note will sound ok before they play it. So as you can see, the first step in learning how to play lead guitar is understanding keys. That’s what we’re going to look at now. Excited? You should be, you’re about to learn about the DNA of music – a huge part of learning how to play lead guitar. Let’s go! How To Play Lead Guitar Ninja-Style! The most important piece of information a lead guitarist needs to know is what key a piece of music is in. This gives you the freedom to play whatever you want (from within that scale) and be safe in the knowledge that you won’t jam out a bad note. This means you can truly improvise. Huzzah! To learn how to play lead guitar you must be able to quickly ‘diagnose’ keys. Here’s a super-simple method to identify the key of a song: 95% of the time the key of a song is either the first or last chord. If a song starts and finishes with the chord of Cm, then the key of the song is Cm. What if a song starts or ends with a 7th chord? Treat major sevenths (eg Cmaj7, Dmaj7) as major chords. Treat minor sevenths (eg Am7, Cm7, Dm7) as minor chords. If a song starts and finishes with the chord of Cm7, then the key of the song is Cm. If a song starts and finishes with the chord of C7, then the key of the song might be C major or C minor. Try both. Once again: 95% of the time the key of a song is either the first or last chord. Pretty simple huh? This is vital part of learning how to play lead guitar. You’re off to a great start! Let’s try this out. Can you tell the key of this song? If we look at this simple progression…. The first chord is A, so we’re already starting to think that the song could be in the key of A. We need to confirm our theory. We can see it’s also A. This tell us the song is in the key of A major. Easy! This is a critical part of learning how to play lead guitar, so I hope you’re following this ok. Let’s look at some more examples. Here is a blues chord progression. What key is it in? The first chord is E7. The last chord is E7. This song is in the key of E major, but because it’s using bluesy seventh chords a minor key will sound awesome too. For dominant 7 chords (A7, E7, D7, etc) we can often use both major and minor scales. So in this example, we could play anything in the scales of E major and E minor here. They would both work. What if the first and last chords aren’t the same? Try the last chord first, as it will usually be the winner. Either way, you have a 50/50 shot at getting it right and you will quickly eliminate the wrong one. Are there other ways to work out a song’s key? The acid test to check if you’ve correctly identified the song’s key is to play the scale for that key. (We’ll cover this in the next section.) If each note of the scale sounds ok over the song, then you nailed it. Well done! Important point: Key’s can change! While learning how to play lead guitar you must remember this: There are no absolute rules in music. This means that a song can change key from moment to moment! In that other 10% there are tons of songs that have ‘black sheep’ chords. These are chords that don’t ‘fit’ into the same key of the rest of the song. Raising a song’s key during the outro is a common technique in pop music, but key changes are usually much more subtle than this type of ‘global’ raise. Sometimes, a song may switch key entirely for a bridge or chorus section and revert back to the established key during the verse. So there will be plenty of times when you think you have the key of a song nailed down only to find there’s a curveball or one chord in the song where the scale you’re playing doesn’t work. This means that learning how to play lead guitar can seem more difficult than it actually is. But stick with the principles we’ve covered here and you’ll pick it up quickly. CHECKPOINT: Consider your amp tone! Before we move on to discuss scales, it’s important you take a moment to think about what sound you want from your amp. Even the best lead guitarist in the world can sound bad if their amp tone doesn’t blend well with the rest of the music. Think carefully about this! It’s a huge part of learning how to play lead guitar. Do you want to use a clean channel? Or do you need a distorted/overdriven tone? Would some reverb help your sound ‘sit’ better in the mix? Does your guitar blend in or stand out more if your tone is bright and sharp? What happens when you turn up the bass and lower the treble? How does boosting the mid alter your tone? What pickup will you select and how will you dial your tone and volume controls? Try them in different positions. Part 3 – Guitar scales decoded: A simple explanation, at last! You don’t need to be a master. You just need to know the basics. Don’t worry, I’ll make it really easy to understand. A scale is simply a group of notes. That’s all. But there are two established scales that prevail and that music theory is based on. If you want to learn how to play lead guitar you need to know both. Both of these scales have 7 different notes in them. To make things easier for ourselves, we often play these two scales in a simpler form. In these simpler forms, we take out 2 of the 7 notes. A pentatonic scale has 5 notes. This makes things a lot easier for you! In our quest to learn how to play lead guitar these two scales will be our best friends. The scale we’re going to focus on today is the Minor Pentatonic scale. The Minor Pentatonic Scale is one of the most commonly used scales in all popular music and is the easiest and most versatile scale to get started with. For 99% of guitarists this is step one in learning how to play lead guitar. For today’s lesson we’re going to use the minor pentatonic scale in the key of A. That means the full name of the scale we’ll play here will be the “A Minor Pentatonic Scale”. This is ‘box 1’ of the minor pentatonic scale. So what are guitar scale ‘boxes’? Just forget about boxes 2, 3, 4 and 5 for now. For your first 6 months of learning lead guitar, focus solely on box one. One of the coolest things about guitar scales is they stay ‘fixed’ as you move them up and down the fretboard. This makes learning how to play lead guitar much easier! The scale pattern doesn’t change. The only thing that changes is WHERE you start the pattern on the fretboard. On this image below, the thickest string (the 6th string) is on the far left. The thinnest string (the 1st string) is on the far right. If you don’t know how to read chordboxes like this, you should check out our article “How To Read Chordboxes In 60 Seconds“. See the root note at the top left of the above picture? This is your starting point. This should be the first note you play. Can you see how the scale we’re playing is ascending with each fret? The pattern that we move our fingers in remains the same. The only thing that changes is what fret we begin the pattern on. This is crucial for learning how to play lead guitar. Let’s recap! You can play them anywhere on the fretboard. What decides the tonality of the scale is WHERE you start playing it. Play the first root note (the farthest left root note on the scales shown above) to choose. So, for example, if you start playing the minor pentatonic scale pattern on the 7th fret you will be playing the B Minor Pentatonic Scale. If you start playing the major scale pattern on the 10th fret you will be playing the D Major Scale. If you start playing the minor scale on the 3rd fret you will be playing the G Minor Scale. So, we have to start playing the above scale patten on the 5th fret. When we play the minor pentatonic scale we only ever play two notes per string. Easy! Fingers 1 and 4 on the E String. Fingers 1 and 3 on the A String. Fingers 1 and 3 on the D String. Fingers 1 and 3 on the G String. If you want to learn how to play lead guitar you must get comfortable with this one-finger-per-fret hand shape. This is me playing the Minor Pentatonic Scale. Click on the player below to listen. Here’s the tab for what I just played. Can you see how it matches the chordbox pattern I showed you earlier? This exact scale would sound fantastic with a piece of music that had a key of Am. Most of the time you will simply want to match the key of the music. If the key is E major and you play the scale of E major, that will be a perfect match. It will sound great. We’re really getting into the heart of how to play lead guitar now, so let’s look at some specific examples. If the song’s key was Bm, what would you do? You would simply match the key. Play starting on the 7th fret (instead of the 5th) and this will make the root note of the pattern ‘B’. So the scale you would be playing would be B minor pentatonic. I tell all my students to just remember the notes of the 3rd, 5th and 7th frets to begin with. These spell out “G.A.B”. These frets also have dots on them that help you get your bearings. With “GAB” in mind, you have a foothold on the fretboard and can work out other notes from there. So you simply move the minor pentatonic scale pattern up and down the neck and begin on the root note that corresponds to the key. Hey presto, you will be playing in a key that sounds great! Ok, so the minor pentatonic scale sounds great over minor keys (and SOME major keys), but what about the others? In this case, the easiest thing to do is to ‘convert’ your minor pentatonic scale into a major pentatonic scale by moving it down 3 frets. Yes, I know, but this is a ninja tip, so concentrate and stay with me here! This is an incredible timesaver for beginner guitarists. You need to play in C major too. (C minor MIGHT work, depending on the style of music.) But C major WILL work. If you start playing this pattern on the 5th fret, you will be playing A minor pentatonic. But, here’s the twist. There’s a weird thing in music theory where scales can be ‘relative’ to one another. Don’t try and figure it out right now, it will make your head explode. Just accept that it’s true! And be grateful for it, because it saves you a TON of extra work (and makes learning how to play lead guitar a lot easier). Find ‘C’ on the 6th string (the low E string). As you can see, it’s on the 8th fret. So we need to go DOWN 3 frets, to the 5th fret. Going DOWN 3 frets is how we find a major key’s ‘relative minor’. In your eyes, it would seem that we’re now playing in A minor. And that’s true. However, we now know that the A minor scale shares the exact same notes as the C major scale. These two scales are ‘relative’ to one another. If we play the A minor pentatonic we will also be playing the C major pentatonic. This 3 fret ‘space’ between a major and its relative minor applies for all chords and scales. It’ll take you a while to get comfy with this concept. During this time, it’s important not to get these the wrong way around! If you want to learn how to play lead guitar, you must understand this. So let’s make it really clear…. Find the corresponding root note on the 6th string. Start playing the minor pentatonic scale there. The relative minor to a major key is ALWAYS 3 frets lower. I hope you’ve found this useful? This is is really mind-blowing stuff for people who encounter it for the first time. In my experience it takes EVERYONE a few weeks to wrap their heads around this concept. If you are confused right now, please trust me that A) it’s normal to be confused and B) this knowledge will teach you how to play lead guitar. It really is all you need to know. Don’t worry if this doesn’t make sense initially. That’s normal. Play around with the concepts I’ve explained above and let it sink in. Return to this guide again and again. It will take time for you to internalise these concepts. You internalise them by playing. You will need to read and play, read and play, read and play, several times before you internalise all this. Most people need to see, think and do all of this from multiple perspectives before they truly understand how it fits together. You may want to bookmark this article so you can return to it again in the future to revisit these concepts. Ok, let’s move on and look at the next part of learning how to play lead guitar, the CAGED system! INTERLUDE: Matching a scale to a key – one more example! This is such an important point, I thought we’d include another example here. Let’s say we want to play some lead guitar over a piece of music in the key of “D Major” (i.e., the first/last chord is D). In this situation what scales can you use? Either the D Major Scale or the D Minor Scale. All these scales will work well over a piece of music in D major. Ok, let’s move on to the CAGED system. This is so cool, you’re going to love this. Learning how to play lead guitar is, at heart, very simple. Play stuff that sounds good with the other stuff. So far we’ve looked at keys and scales. These things are note-based. But now we’re going to look at something chord-based. For most people who want to learn how to play lead guitar, this is much more straightforward than understanding keys and scales. Let’s do it. The CAGED system is one of those things that lots of guitar learners hear about, but in my experience, they rarely understand it. If you want to learn how to play lead guitar, you need to ‘get’ this! Like all of this technical stuff, it sounds very confusing, but it’s actually pretty simple. We learn open chords first. We press these shapes down and strum. Some of these shapes are ‘fixed’ in place. We can only play them as open chords on the first 1-3 frets. But not all chords are ‘fixed’. In fact, many chords are what we call ‘moveable shapes’. They can be moved up and down the fretboard to play other chords. We just slide the chord from it’s starting position to another place and play it. Hey presto, we hear a new chord, even though we’re still holding the shape of the original chord. Our hand may be making the same chord shape, but because we’re applying the shape in a different part of the neck what we HEAR is a different chord. If we take an ‘A’ chord…. We sometimes move these shapes around by putting a ‘barre’ behind them. These chords are then called ‘barre chords’. But we can play plenty of moveable shapes without the barre if we choose too. In fact it’s sometimes easier. There are five main moveable shapes. To learn how to play lead guitar you need to at least be aware of all 5. The five moveable shapes are based on the following chords: C, A, G, E and D.
And for that reason, we refer to this as the ‘CAGED system’. It’s not really a ‘system’ at all, it’s just an acronym we use to remember these 5 shapes. So you know now that you can slide C, A, G, E and D chords up the fretboard to make other chords. In your mind, you will always perceive them as C, A, G, E and D chords because that’s how you first learnt them. But as you move them around the fretboard they become other chords. Earlier, we distilled the essence of how to play lead guitar by saying ‘play stuff that sounds good over the other stuff‘. Well one of the things you can do that will ALWAYS sound good over the other stuff is to play along with the chords of the song. But of course, if you literally just strum along and replicate exactly what the other musicians/instruments are playing, that will be pretty boring. It won’t add much to the track at all. But if you play the same chords, but with a different voicing, that will sound awesome. This is a critical point for learning how to play lead guitar, so stay with me here! 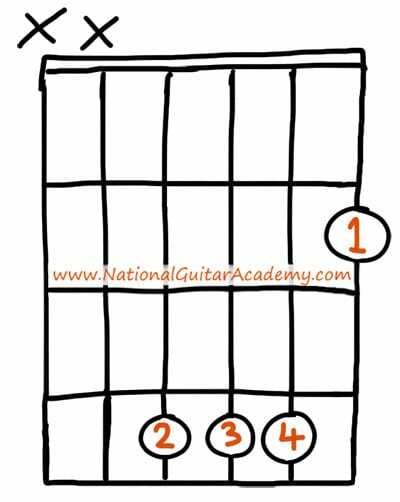 If you want to play a G chord, you could play it in 5 different positions using C, A, G, E and D chord shapes. 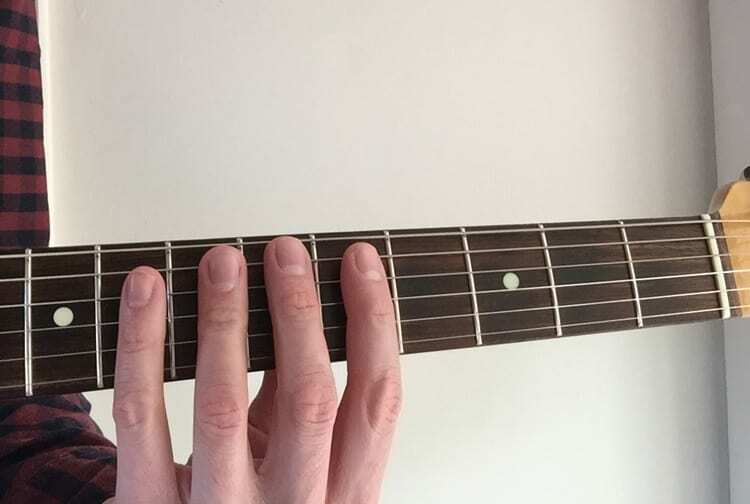 If you play a barred C shape starting on the 7th fret, that chord is G.
If you play a barred A shape starting on the 10th fret that chord is G.
If you play an open G shape, that chord is obviously G! If you play a barred E shape, starting on the 3rd fret, that chord is G.
If you were to play a D shape on the 7th fret that chord is G.
Can you see our CAGED system in the above examples? Now of course, some of these shapes are very fiddly to play, so most of the time we don’t play them! But we DO play the shapes that are easier to play. And these can be a lead guitarists best friend. If you want to learn how to play lead guitar you must get comfortable with the E, A and D shapes from ‘CAGED’. By a long distance, the E shapes, A shapes and D shapes are the ones that get used most often. 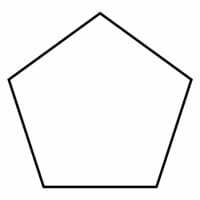 When we play the A and D shapes, we can just play the triads and abandon the barre. This sounds fantastic! So instead of playing our G like this (as a barred A shape)…. Can you see that this is the same as the above chord, but we just omitted the notes from the 10th fret? Now this is EASY to play. We can play it with one finger! This type of TRIAD shape is the distilled essence of the chord. It is the sound in its purest form. It can sound a little lost when played by itself, but when used in a complementary setting as lead guitar over a rhythm guitar, it sounds fantastic. 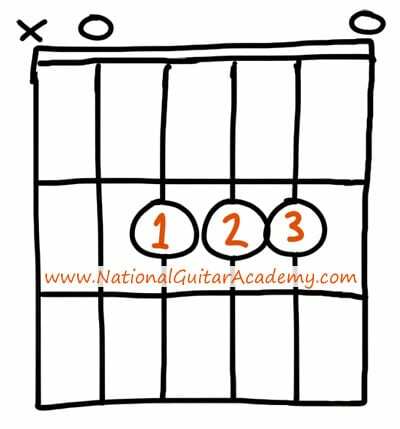 If you want to play over a G chord, but you don’t want to simply strum a G, then you could play this triad. Or you could pluck the notes out, arpeggio style. This will complement what’s already being played. With some effects added, triads can sound devastating. Try it! Again, this sounds fantastic as a secondary guitar piece. It’s very high-end and that treble can cut through and really balance out a chunky and full sounding rhythm guitar. If one person plays a bass-heavy power chord and another play a high-end D triad, you create a very full and well-balanced overall sound. Listen to something like ‘The Bucket” by Kings of Leon to hear how cool simple triads can sound as lead guitar. Can we used CAGED with minor chords too? Yes. We simply use the minor chord shape and move that up the neck as we did for the major shapes. To learn how to play lead guitar, you must know and use the CAGED system. Let’s recap. We can play all chords in 5 different shapes. We do this by moving the open chord shapes of C, A, G, E and D up the neck, as moveable shapes. The easiest ones to use are E, A and D.
Ok, let’s move on and look at some specific tricks you can use to learn how to play lead guitar, like riffs, string bending and vibrato. So far we’ve talked about lots of ‘conceptual’ stuff in this guide – and that’s important because understanding these concepts means you will understand the instrument! But now let’s look at some specific practical techniques. This is where we bend the string up (or down) to make the pitch of the note go higher. If you want to learn how to play lead guitar this is an essential skill. When we bend the strings it’s really important that it’s nice and relaxed. You don’t want to feel any tension/pain when doing this. It should feel absolutely comfortable. Be relaxed, you don’t want to feel any tension or pain when doing this. Always aim for a note, our bends should always be in tune! (To help with this, we can pick a note higher up and bend up to it. By aiming for the note, it allows to improve our bending technique.) You’ll see an example of this in the video below. Make sure you have a smooth turning motion in your wrist when bending. Bending strings with one finger will make your fingers ache and your bends will lack control. Use 2 or 3 fingers when you bend strings. This will add strength and control to your bending. Here’s an example of a lick which contains bends. As a simple exercise, now try adding bending to your solos and here how it sounds. This can often add a slippery sound to our solos, which can be really cool and add an element of fluidity that juices things nicely. When sliding always make sure it’s nice and smooth going to the target note, we don’t want to over slide. Target your note and nail it with confidence. Here’s an example of a common sliding lick that you can practice as you learn how to play lead guitar. Now try to solo using some sliding! When using vibrato technique, we use a similar motion to bending but with an important difference: When bending we use our wrist to bend up and we tend to move it at a larger angle. But with vibrato we use the same technique, but with a much smaller movement. We usually use vibrato at the end or start of our phrases. Vibrato is a great way to finish phrases. It’s subtle, but it adds a classy touch and makes everything sound more polished. This level of refinement and attention to detail is important when learning how to play lead guitar. Little things matter! Can you hear the vibrato at the end? Try playing it without the vibrato and listen to how much more abruptly it ends. Now try to solo over a backing track using vibrato technique. If you want to learn how to play lead guitar you must learn how to do hammer-ons and pull-offs. These are essential techniques. The key point here is that we pluck the note only once, at the start. When our finger hammers-on we hear the second pitch. So we pluck once, but hear two pitches. The second note uses the force of the first pluck. A pull-off is a hammer-on in reverse. And again, we only pluck once. To learn how to play lead guitar we must practice this technique. Now try and use some hammer-ons in your solos. Bonus Challenge! Can you solo with all 4 techniques? Try a practice solo and use all four techniques. The most important thing here, as ever, is to have fun and enjoy it. Techniques like these are the icing on top of the cake when we learn how to play lead guitar. In isolation, none of them seem hugely important but when they’re combined they make a huge difference. A huge part of learning how to play lead guitar is learning to improvise. An important aspect of learning how to play lead guitar is listening to your favourite genres. Actively listen. Try and notice what gives a piece of music it’s character. It’s hard to do, but sharpening your ears like this is a key part of learning how to play lead guitar. For example if you want to learn how to play blues music, you should listen to that genre and try and pick out its idiosyncrasies. By doing this you are learning how the genre sounds and FEELS. I call this ‘active listening’. It takes practice, but it rewards you richly. Getting some classic lead guitar phrases under your belt can give you some good tricks to fall back on. This is a very practical way to learn how to play lead guitar. When we want to play a certain genre or style, it’s a good idea to have a couple of suitable phrases or licks under our belt beforehand. If we learn a few musical phrases which are in that genre, we immediately begin to sound like that genre. Here a few licks I’ve prepared which use the trusty A Minor Pentatonic scale. I decided to make them bluesy, as blues is great for soloing. Try this out. Can you repeat it after me? What did you think of that one? A little harder? What do I do with these riffs? Remember, a key part of learning how to play lead guitar is learning how to improvise. I also like to use the smartphone app “Jam Tracks”. You tell it what key you want to jam in and it will play an appropriate backing track. This is a brilliant way to improve your improvisational skills and solo ability. You tell the app the key and then you can wail all over it in an appropriate key. We learn the most about music by trying out different ideas. 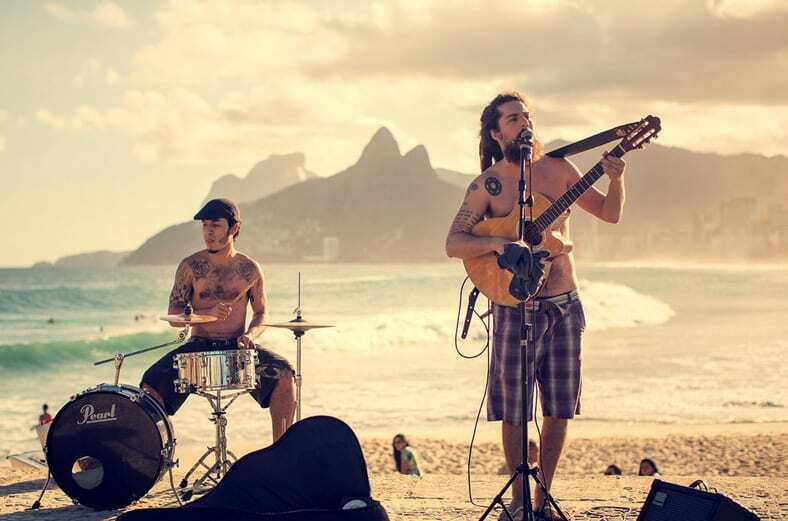 Practice with different genres and jam with other musicians as much as possible. This is by fay the quickest way to grow as a musician. Root notes are the very first note in a chord or scale. It’s the most important note. So for example, an A major chord has the notes A, C#, and E in it. But the most important note, at the ‘tonal centre’ is A. The root note of an A chord is ‘A’. The A string is the first note we play in the chord. 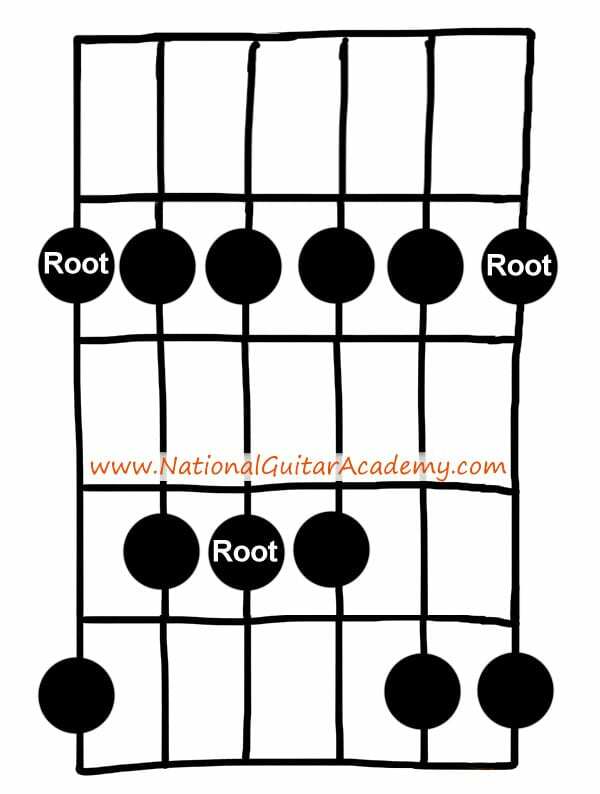 It’s the chord’s root note. To understand how to play lead guitar we must use this to our advantage. The root note is always the name of the chord. The root note of a C chord is ‘C’. The root note of C minor is ‘C’. The root note of C minor 7 is ‘C’. The root note of “C minor 7 diminished 5th added 9” is ‘C’. Why does that matter to a lead guitarist? Because it applies not just to chords, but to keys and scales too. If you play the A Minor Pentatonic scale, the root note will be ‘A’. This means you should finish your licks and phrases on an ‘A’ note. If you don’t do this, things will sound ‘unfinished’. Learning how to play lead guitar means you must understand how to finish your licks or riffs. The root note will always sound great at the end. This means that the root note in an A Minor Pentatonic scale is A.
It’s the most important note in the scale. It will always sound good! Use it a lot. Finish your phrases on this note. Is there only one root note in a scale? Yes and no. The root note, in this example, will always be ‘A’. But there can be multiple ‘A’ notes in there. They are all root notes, but they sound different to one another because they’re octaves apart. In our above example you will spot the other root notes on the 7th fret of the D string and on the 5th fret of the high E string. These are your hero notes, use them lots! When we solo we want to try and target root notes to finish our phrases and licks. Why? Because they bring a sense of ‘resolution’. Great lead guitar work has both tension and resolve. If you want to learn how to play lead guitar you must be aware of this. Light and dark. Rise and fall. We need both otherwise things become one-dimensional. By targeting the root note, it allows us to hear that the phrase has finished. This is good for the listener. It feels ‘right’. Here are a few simple exercises you can do to help you with this. Find all the root notes in the scale. Play a lick which starts on a root note. Play a lick which ends on a root note. Play a lick which starts and ends on a root note. By targeting these notes, it allows our licks to sound strong and defined. If you want to learn how to play lead guitar you simply must know this. Sometimes, you will deliberately not do this. This ‘plays’ with your audience. They are anticipating the resolution of the root note. If you don’t give it to them this drives tension. Good lead guitarists use tension and resolve to their advantage. Develop this technique as you learn how to play lead guitar. This Rolling Stone article is a great place to find inspiration and ideas (and an epic list of incredible guitar songs) that will help you in your journey to learn how to play lead guitar.